Sales by wards provides another insight to the state of the District's housing market. Average prices grew in 5 of the 8 wards (2-5, 7). Prices in Ward 8 continue to deteriorate. Ward 1 slid into negative territory after teetering on the brink in March. Excluding new condos affected prices in Wards 2 and 3, but not enough to tip them into the red. 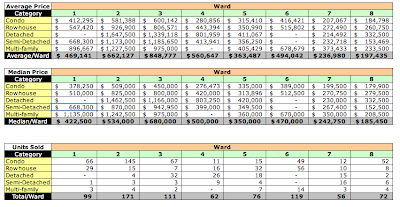 In Ward 2, their exclusion had a negligible effect; in Ward 3, their exclusion reduced average prices by $50,000 and median prices by almost $60,000. YoY sales volume was affected: it went negative in Ward 2 (from +27 to -12) and was shaved in Ward 3 from +22 to +2. Removing new condos from the analysis reined in Ward 8's explosive growth in sales volume, cutting it from +148.3% to +13.79%, showing that Christopher Condos and Brandywine Crossing skewed the numbers. On a positive note, that exclusion also trimmed the negative average and median price changes YoY for the ward. The following tables show the YoY aggregate sales data for each ward in April 2007. 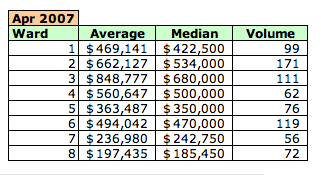 The following tables show the average and median prices and sale volume for the month for each housing category in each ward in the District.